I have an interest in travel journals and in particular those of bygone eras. In the Buddhist context I enjoy reading the journals and histories of past pilgrims who often travelled great distances on foot in pursuit of the Dharma. I find this extremely inspiring as they often went at great risk to arrive at their destinations, facing numerous dangers and difficulties along the way. Here I would like to take a look at the life of Ennin 圓仁 (794-864), a notable Japanese Tendai monk who lived during the Heian period 平安 (794-1185). He lived about a century before Murasaki Shikibu, the author of the Tale of Genji, was born. In his teenage years he served under Saichō 最澄 (767–822), the founder of Tendai in Japan, who had recently returned from China. 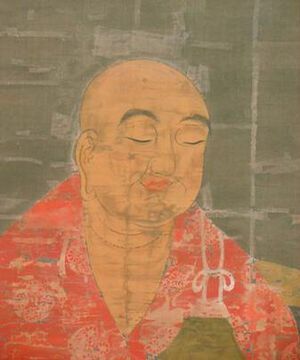 In 816 he received full bhikṣu precepts at Tōdai-ji in Nara at the age of twenty-three. Two decades later Ennin applied for permission to embark on the diplomatic envoy to China with Fujiwara no Tsunetsugu. Formally his duty was to further study Tiantai 天台 (in Japanese pronounced Tendai) doctrine in China, though it seems his real intent was to study Mikkyō 密教 or esoteric practices. In 838 he arrived in Yangzhou, but not before having a dangerous voyage at sea that nearly saw him shipwrecked. The following year he was told by the local officials that visiting Mount Tiantai was unacceptable given that he was part of a diplomatic mission, and not a formal scholar. He was told he would have to leave with his fellow countrymen. Nevertheless, he decided to stay behind albeit with a word of strong caution from his superior in the envoy. The laws of the Great Tang were much stricter than in Japan, he warned. This was actually quite true given how travel throughout the country required burdensome documentation, which in the case of Ennin often delayed him considerably. The Tang empire employed intrusive levels of policing. Ennin was a member of the last Japanese diplomatic mission to China during this period. There was another mission planned in 894, though it was cancelled in the end given the political circumstances in China. The Japanese court was aware of the rapidly collapsing political situation on the mainland and even received warnings from a compatriot monk there. In any case, as some scholars have noted by the ninth century Japan had already absorbed vast amounts of Chinese knowledge and technology, and some even felt they had surpassed the Tang. The early voyages to China in the seventh and eighth centuries were motivated by a desire to acquire knowledge, technology and religious institutions such as Buddhism, perhaps partially compelled by political events on the mainland such as the joint Tang-Silla conquest of the Korean peninsula in the 660s. By the ninth century, however, diplomatic missions seem to have been more aimed at securing Japan's position on the international scene. Nevertheless, there were still new things to learn like Mikkyō which Ennin's predecessor Kūkai 空海 (774–835) a few decades prior had expressly studied in China under Huiguo 慧果 (746-805). While in China Ennin studied Sanskrit. He also received initiations into the Garbhakośadhātu Maṇḍala and the Vajradhātu Maṇḍala as well as other esoteric doctrines and practices. He also visited Mount Wutai 五臺山 where he engaged in various practices. By 840 he was in the capital Chang'an where he extensively studied esoteric subjects, in particular gaining expertise in the susiddhi tradition. He also lived through the persecution of Buddhism which started by 845 under Emperor Wuzong 武宗 (814-846). Ennin recorded state directives which saw all Manichean priests executed. There was a vast purge of Buddhism as well with countless monastics defrocked and pulled out of their temples. Ennin made the wise decision to leave, but not before putting on lay clothes and making his way back to Japan via Korea, arriving home in 847. Ennin is notable for being one of the early patriarchs of the Japanese Tendai school, but also specifically for this journey he took to China. His journal The Record of a Pilgrimage to China in Search of the Law (入唐求法巡禮行記) details his long journey in remarkable detail. There is actually a translation of it by Edwin Oldfather Reischauer done in 1955. A recent extensive study in English was done by Jesse Dalton Palmer (see here). Ennin's journal is an extremely valuable first hand account and witness to history. Besides detailing his religious activities and some political developments that he personally lived through, he also notes much of his daily activities – the food he ate, the things he saw along the way, the conversations he had and the weather. The human interactions he records are at times quite heart-warming. For instance, Ennin had the good fortune during his time in China to meet with a certain monk by the name of Jingwen 敬文 who had met Ennin's late master Saichō. One thing to note in the following account is that he “writes” to Ennin although having come to personally visit him. This is actually probably due to Ennin at the time either speaking limited Chinese or because they spoke mutually unintelligible dialects. It was common practice at the time for educated people who did not speak a common dialect (or language in the case of many foreigners who could read and write Classical Chinese, but could not speak anything) to “converse by the brush” (筆談). Stories like this make Ennin's journal quite down to earth and touching. It is amazing to think that at the time he could encounter a monk who knew Saichō from three decades prior. The Buddhist world, at least in the region they were in, might have been relatively close-knit, the foreign monks being quite noteworthy and welcome visitors to the community. The government sponsored monks from Japan were by no means beggars and came with ample funds when they arrived in China. They were also generally intelligent and educated individuals. The Tang state likewise felt obliged to accommodate foreign students and monks. It was through such projection of soft cultural power that much of East Asia adopted Tang cultural forms including such things as clothing, architecture, statecraft, religion and even food. The court in Japan, based on the Tang model, also legitimized its authority by virtue of emulating the Chinese superpower. Much of what is considered traditional Korean or Japanese culture in the present day was originally adopted from China during the Tang Dynasty (618-907). China in this period served as a central model and benefactor from whence civilization was exported to satellite cultures which readily adopted Chinese ways, although simultaneously many foreign cultural elements from India and Central Asia found their way into mainstream Chinese culture, which in turn was passed on to Japan and Korea. While speaking with (or writing to) Jingwen he asked about the number of monks and abbots at Tiantai, which provides us with a picture of the scale of the monastery complex at the time. This is useful as it provides an account of the population of Tiantai in this period. The Tiantai school in China was influential despite being located away from the center of power further west (see Google Maps). 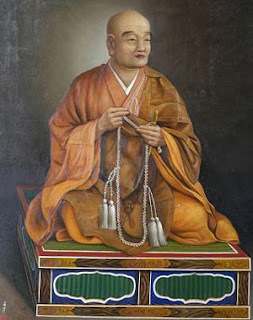 Nevertheless, as Suzuki Gyōken's 鈴木行賢 paper “The Buddhism of Tang Chang'an and Tiantai” points out there were some Tiantai teachers who spent time in Chang'an interacting with the diverse new forms of Buddhism that were being received from India, which naturally influenced them and the direction the school took. Hence, despite the relative distance of Tiantai from Chang'an, it still had a role to play in the upper echelons of Tang Buddhism. Despite the smaller monastic population, it remained an influential community. Ennin [I] and the above individuals accompanied a tributary envoy in Kaicheng 3 (838) in pursuit of the Buddha's teachings. In the third month of this year we requested permission through Qingzhou to visit Mount Wutai where we venerated the holy relics. Arriving here [in China] we intend to study the holy dharma. We request residence in the city monastery so we may seek teachers to study under. We humbly request you handle the aforementioned matter. Sincerely – Ennin, Japanese Monk Pursuing the Dharma, Kaicheng 5 , 8th month, 23rd day. It was of course not all troublesome matters he had to contend with. He also kept note of cultural events he encountered. He celebrated Chinese New Years and recorded the details as follows. 12th Month, 29th Day. Evening – the monastics and the laity together burnt paper money. The laity later in the night burnt bamboo and with a popping sound say, “Wansui! [Banzai]” In the streetside shops there are a hundred varieties of food and it is exceptionally full. In Japan on this night people have lamps everywhere in the house, courtyard, rooms and in front of the gate. The Great Tang is not so as only a [single] lamp is kept illuminated all the time which is unlike Japan. The temple and households later in the night strike bells and the assembly of monks gather together in the dining hall to venerate the Buddha. When venerating the Buddha the assembly all get up from their chairs and set some cushions on the floor. After venerating the Buddha they again take their seats. Then there were the logistics and kitchen monks who read and outlined in front of the assembly the various expenditures (?) for the year, making it known to the assembly. Before it reached dawn a meal was consumed in front of the lantern. After finishing eating the assembly all dispersed to their rooms. At dawn each left their room to attend rituals and together pay respects. Both temples and households set out offerings and will rest for three days. Another interesting encounter he had was with a group of ministers on an inspection tour. They sat down to have some tea and invited the monks to join them. Naturally there was some curiosity on their part and some questions were posed to the foreign monks. Assuming this student monk is Japanese he is referring to Heiankyō 平安京 (Kyōto) whose specifications were east-west 4.5km and south-north 5.2km, which roughly approximates to the estimate provided above, though Heiankyō was planned on a rectangular grid so it was not square as suggested by the student monk. It had become the capital in 794, initiating what historians call the Heian period (794-1185). It is also notable that he states there are no Daoist masters in Japan given that in China and Korea alike there were such individuals. The details about food, weather, local conditions (famine for example) and the customs he observed paint a rich narrative that brings the late Tang Dynasty into vivid focus. More importantly perhaps are the details he provides in 845 when the state under Emperor Wuzong, who was something of a Daoist zealot, ordered a massive purge of Buddhism from the country. The state lacized countless monastics, leaving them stranded in the streets and forbidden from stepping foot in the monasteries again as Ennin reported. The state also appropriated monastic property for its own purposes. More shocking was that the state also formally ordered the execution of all Manichean priests in the country. A directive stated, “Foreign [monks] will also be forced to disrobe and return to their home countries if they do not have documentation from the Ministry of Rites.” North Indian Tripiṭaka Master Nanda from the west countries was at Da Xingshan-si. South Indian Tripiṭaka Master Ratnacandra and his four disciples had trained in middle India. They understand and practice the Great Dharma. They are meticulous in their practice of the Vinaya, and erudite in their understanding of sūtra and śāstra. They are at Qinglong-si and have no documentation from the Tang Ministry of Rites. There are also many Silla monks who do not have documentation from the Ministry of Rites. The Japanese monks Ennin and Yuishō also have no documentation from the Tang Ministry of Rites. The state monastic controller [功德使] decreed laicization in our case. They also posted a document at the temples: “If there be any monks or nuns who do not submit to laicization, they will be deemed guilty of violating the directive and at that time will be put to death.” Hearing about this, I bundled my papers. I wrapped up in clothing all the sūtras, śāstras, teachings and maṇḍalas I had copied. The documents and clothes were altogether four baskets. I then bought three donkeys to manage it all. In my mind I was not worried about disrobing. I just worried that I would be unable to bring the holy teachings I had copied. There was a directive again to dismantle Buddhism. I feared on the roads I might be inspected by prefecture offices and they would discover the truth, and that I would be guilty of violating the directive. Despite the dangers, Ennin made it back to Japan in 847, carrying with him 584 texts, 21 religious implements as well as some paintings and maṇḍalas. The Huichang persecution also damaged imperial legitimacy by forcing a stark conflict between Tang officials’ divided loyalties to the imperial system and to Buddhism. By creating a situation where many officials ignored or disobeyed imperial commands in order to help monks, the emperor effectively undermined his own sovereignty. Examples of this kind of behavior are especially evident in the final section of Ennin’s journal, when he was laicized and allowed to leave Changan to journey back to Japan. Along the way, Ennin was aided by various officials who continued to treat him as though he were a monk, despite his lay status. The Sillan interpreter even risked much more by hiding Ennin’s collected Buddhist materials until they could be taken back to Japan. Ennin also reports that the regional commanders completely ignored the emperor’s commands. Within a few generations following Ennin's departure the Tang dynasty collapsed in 907. The purge of Buddhism highlighted divided loyalties among members of society. While the state held itself as the ultimate authority in the world, there were clearly still plenty of individuals with Buddhist inclinations who would disobey imperial directives. It was just such friction that originally led to the purge. Buddhism by the late eighth century had come to command vast amounts of land and wealth, which many elites saw as a risk to the authority of the court. There was of course corruption and ordinations for sale (they exempted one from forced labour), but the Buddhist project in China generally still respected the state and the imperial system as they were essentially beneficiaries of the court. The parallel in Japan is clear enough as well. Ennin despite having seen the wrath of a tyrant did not challenge the existence of such a system as he himself depended on the largely autocratic system in place in his homeland for his support. Notions of checks and balances to control tyranny were perhaps alien to him. However, when the state was favourable to Buddhism, the religion fluorished and received political perks. It was the same in both Japan and China. Ennin had spent five years in Chang'an studying tantra, which was more than Kūkai who had only spent half a year under Huiguo. It enabled him to challenge the Shingon monopoly on estorica. Ennin had received thirteen different initiations while in China, including that of the Susiddhi Tantra, which Kūkai had not received. His command of the esoteric teachings enabled him to receive prompt recognition from the court in Japan, which in turn halted the decline of Mount Hiei. He was further able to have initiations sponsored for the throne and protection of the state, which were first carried out at Enryaku-ji in 849. After 850 he was invited to the palace to confer precepts unto the imperial family and carry out rites. In 856 he performed an initiation for Emperor Montoku 文德天皇 (826-858). Mount Hiei was increasingly benefiting from Ennin's influence at court. In 850 Emperor Montoku had Sōji-in built there which accommodated fourteen monks whose function was to recite prayers to the emperor's birth star for the well-being of the country. The Tendai school in the same year was further authorized to perform annual initiations as transmitted by Ennin from China, thus legitimizing the new esoteric lineage within Tendai. In 866, two years after Ennin died, the court conferred posthumous titles to both Saichō and Ennin: Dengyō Daishi and Jikaku Daishi respectively, which reflects the success of Ennin's endeavours at court. This actually preceded Kūkai's honorary title of Kōbō Daishi, which was conferred in 921. Ennin's journey marks the end of a period of formal Japanese missions to Tang China. In the preceding two centuries vast amounts of culture and knowledge were imported from China and readily digested. By the ninth century there was much less need for such missions, but nevertheless Buddhists in particular had compelling reasons to take the journey to China. Ennin became an influential figure in Japanese Buddhism, but beyond Buddhism his journal actually holds as much value as Marco Polo's Livres des merveilles du monde, if not more. It is a witness to a period in Chinese history written while on the ground. Incidentally, the fact that it is written in Chinese, which was Ennin's second language, is likewise important because it preserves conversational Middle Chinese. There has been much written on that subject and I will take a look at it in another post over at my other blog Exploring Classical Chinese. For Ennin's journal in the original Chinese see here. 1 See Tanaka Fumio 田中史生, “Saigo no Kentōshi to Ennin no Nyūtō Kuhō” 最後の遣唐使と円仁の入唐求法 in Kentōshi Sen no Jidai Jikū wo Kaketa Chōjin-tachi 遣唐使船の時代　時空を駆けた超人たち　(Tokyo, Japan: Kadokawa Sensho, 2010), 190-210. 2 See See Stanley Weinstein, "Aristocratic Buddhism" in The Cambridge History of Japan Volume 2 Heian Japan (Cambridge, UK: Cambridge University Press, 1999), 479-485. Blog of Dr. Jeffrey Kotyk. Why did the Buddha prohibit alcohol? Jeffrey Kotyk. Powered by Blogger.